Looking for a balance bike for your child (or grandchild) but don’t want to break the bank either? The Enkeeo is one of the better “budget” balance bikes that we’ve seen. It offers features usually only offered on high-end push bikes–such as pneumatic (air) tires, a handbrake, and quick-release seatpost. That said, there are a few items that made us question the durability of the bike….. In balance bikes under $100, it is pretty unusual to find higher-end features like a handbrake–especially ones that work. The ever-popular Strider Classic, for instance, sells for $90 and offers neither a handbrake nor pneumatic (air) tires. Indeed, the Enkeeo balance bike is the cheapest balance bike we’ve found that offers some of these nicer features. 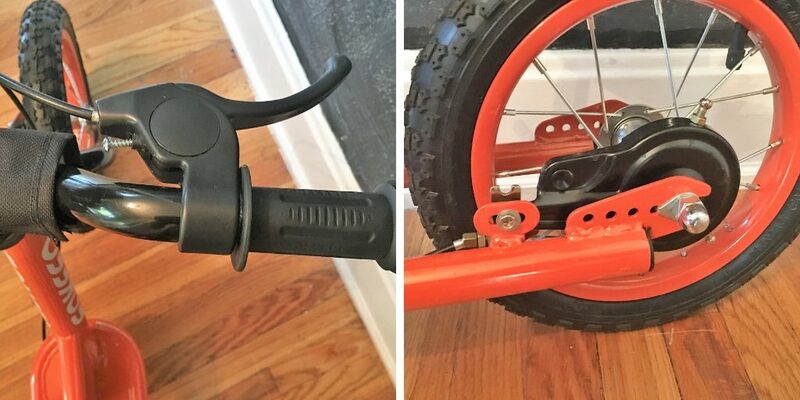 The brake lever on the Enkeeo balance bike is relatively easy for little kids to pull. 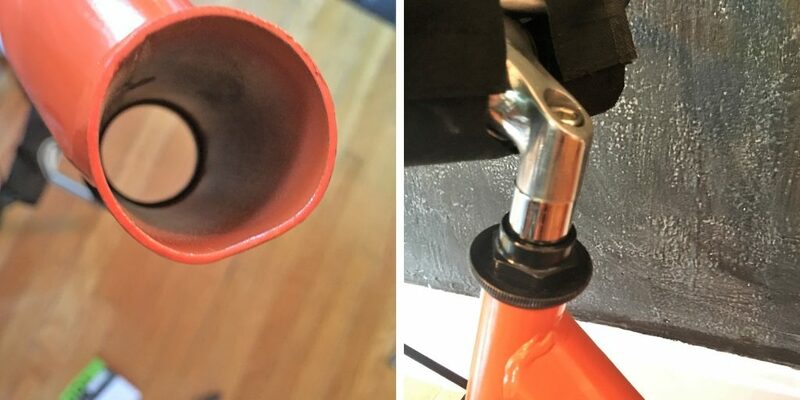 It doesn’t work as well (and isn’t as small) as higher-end brake levers, like the ones on the super-expensive Woom 1, but it is easier to operate than many sub-$100 balance bike levers we’ve tested. It may be a bit challenging for younger toddlers. Why bother with a brake on a balance bike? It’s good practice for when your child is ready to transition to a pedal bike. 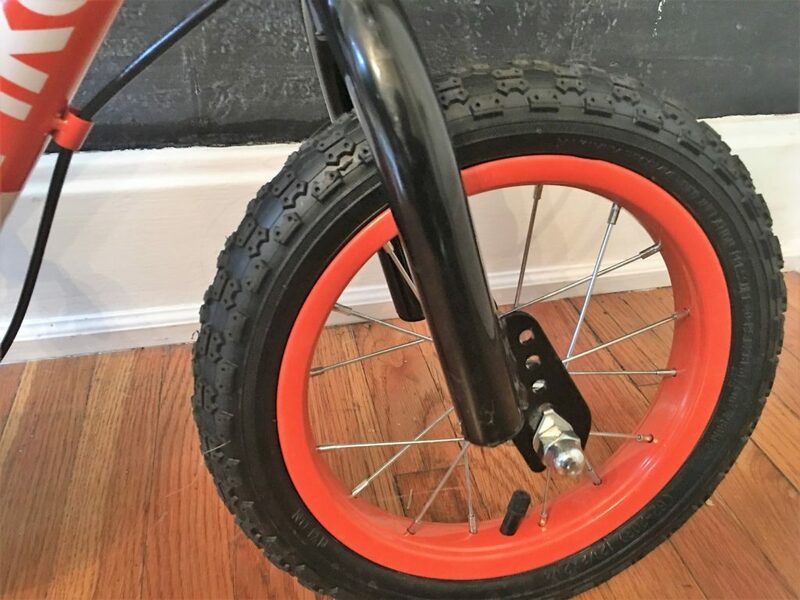 If you’re kiddo already knows how to use a handbrake, they can forgo a coaster brake which makes learning to pedal much easier. It is worth noting that the Enkeeo has a drum brake on the rear wheel. Drum brakes are decent, but are heavier and somewhat less efficient than rim brakes. You won’t find a bike with rim / v-brakes in the sub-$100 price range though. 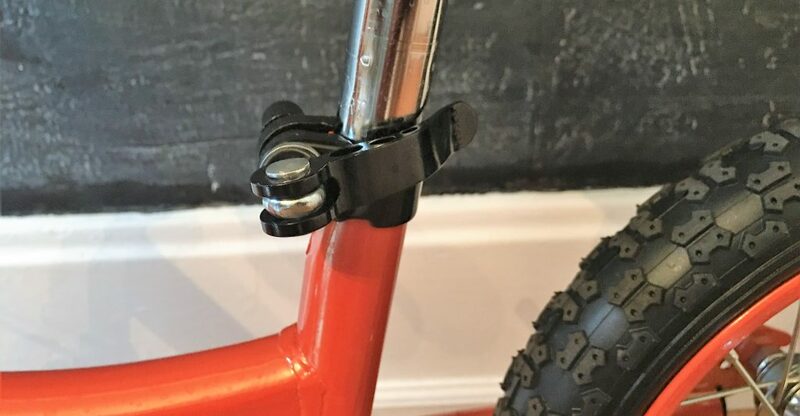 One thing we always look for on kids bikes is a quick-release seat collar. Kids, as we know, sprout up overnight and its normal to have to raise your child’s seat fairly often. A quick-release makes that easy to do without needing any tools. It is also nice to have if siblings or friends will be swapping using the bike. 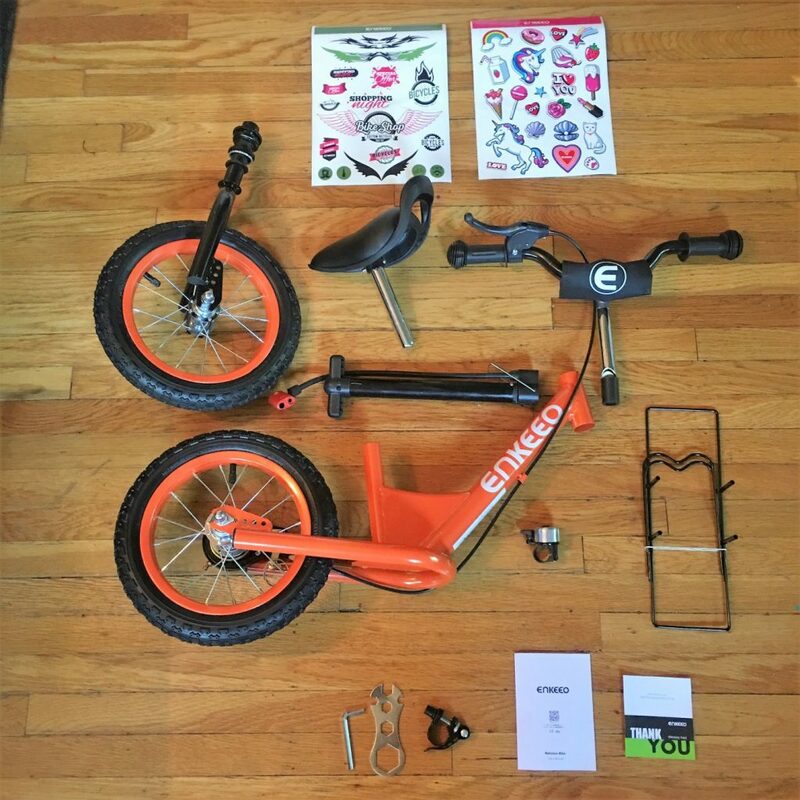 As a kids bike reviewer, I assemble A LOT of bikes, and the Enkeeo balance bike was one of the tougher bikes I’ve had to assemble. In fact, I got so irritated with it, I made my husband finish assembling the bike. The problem is with the installation of the fork and headset. There are a bunch of tiny pieces and the small black and white instructions are basically worthless. Luckily, my husband is mechanically inclined and was able to figure it all out, but if you don’t have patience (like me), this might not be the bike for you. In general, we prefer balance bikes that offer pneumatic (air) tires rather than foam or plastic wheels. Air tires provide better traction, especially when riding on gravel, grass, or wet surfaces. Most cheaper balance bikes do not offer air tires, so the fact that the Enkeeo balance bike does is notable. Of course, the one downside of air tires is the fact that they can (and will) go flat. If you don’t want to mess with maintaining them, or the bike is going to be used primarily indoors in a playroom or similar environment, then you might want to opt for foam or plastic tires instead. The Enkeeo balance bike comes in two versions: 12″ and 14″. The sizing refers to the wheel size. Smaller (12″) wheels are better for younger toddlers, while bigger (14″) wheels are better for older toddlers and pre-schoolers. The 12″ Enkeeo balance bike has a minimum seat height of 13.7.” This means your child needs to have a minimum inseam that is AT LEAST that long. It also means that this balance bike isn’t the best choice for REALLY tiny toddlers, and will best fit those that are at least 2 years old already. The other reason we don’t recommend the bike for younger toddlers is that the bike is relatively heavy when compared to other 12″ balance bikes. 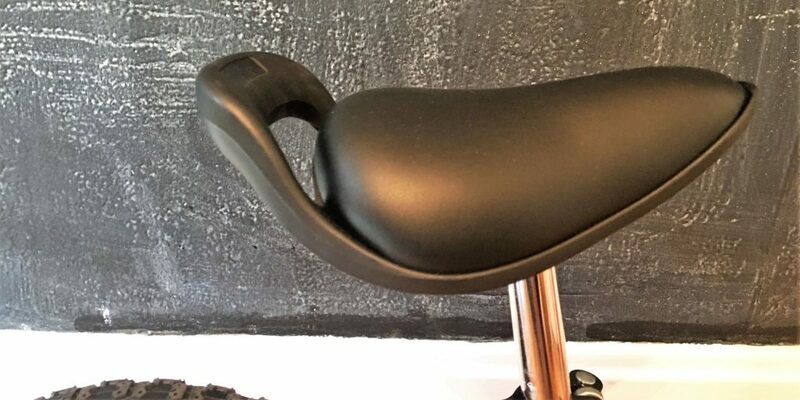 The 14″ bike has a minimum seat post height of 17.7″. Again, measure your child’s inseam to make sure that it is at least this long. In general, the bike will best suit kids with a 4T or 5T pant. We like that the seat has a handle at the back so that you can carry the bike when your kiddo decides to ditch it half a mile from home. It also works well for toddlers who are just learning to ride a balance bike. You can hold on to the handle to help give them balance and control. The handle at the rear of the seat allows parents to both help their child and carry the bike when not in use. We were pretty stoked that the bike came with a hand pump. This is something I’ve never seen before, and for parents who don’t bike or don’t have a bike pump, this is super helpful. The bike also came with a stand, bell, and stickers. We haven’t used the stand much, but it works well for holding up the bike and may help with storage in a playroom or garage. 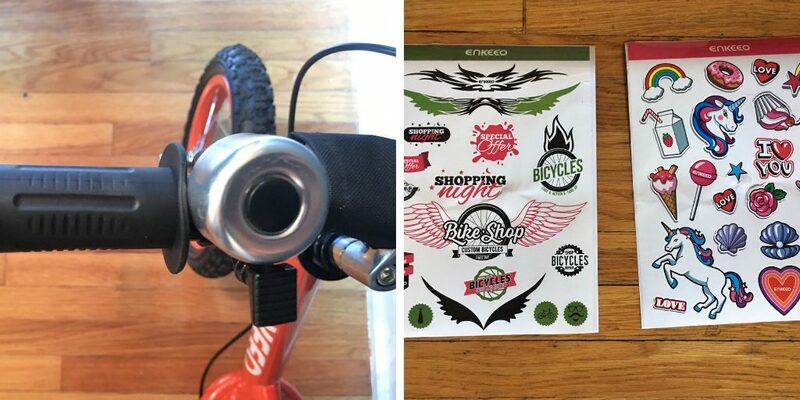 Finally, the stickers that come with the bike are sort of fun for kids and allow them to decorate their bike. That said, many of the stickers have strange phrases–“shopping night” for example. I think something got lost in translation there….. There are a few things about the Enkeeo balance bike that would make me hesitate to recommend the bike to other parents. For one, the frame is made of lower-grade carbon steel. The headtube on ours actually came bent (see pic below), and my husband easily bent it back into place with a pair of pliers. A frame shouldn’t be that flexible. Secondly, the wheels were pretty out-of-true (aka wobbly) straight out of the box. See the video above if you’re curious about this. Finally, the bike comes with a quill-style headset that was difficult to assemble (as mentioned above) and had a tendency to shake loose while we were testing the bike. We were able to tighten it up easily enough, but if a parent isn’t paying attention, this could be a safety issue. Bendable frame material and a headset that shook loose easily were 2 of our concerns with the bike. All in all, I think the bike is good for the price, especially if you plan on using the balance bike as a toy. If you are a more serious biking family or want a balance bike that can last through multiple children, do yourself a favor and spend a bit more money to get a higher-quality bike. Here’s how the Enkeeo balance bike stacks up against other sub-$100 balance bikes. 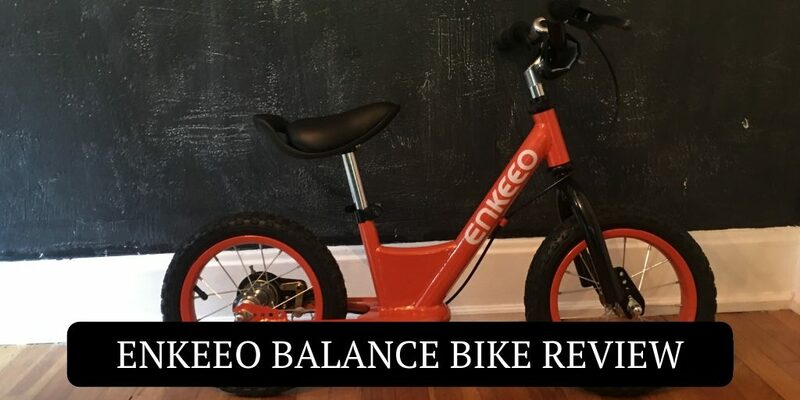 The Enkeeo balance bike offers more than you would expect from a budget balance bike including a handbrake and air tires. It comes with some great extras like a bell, pump, stand, and stickers. The budget price is reflected in the quality of the frame, wheels, and headset, but if you plan on using the bike as a backyard toy, you’ll be happy with the purchase. New to the balance bike concept? You might want to check out these articles to ensure you’re making the best purchase for your little one. It’s necessary that a balance bike with brake, thanks for sharing.